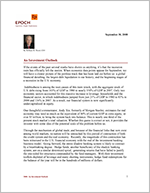 An Investment Outlook - Epoch Investment Partners, Inc. If the events of the past several weeks have shown us anything, it’s that the recession train has officially left the station. When economic data points appear for September, we will have a clearer picture of the perilous track that has been laid out before us: a global financial derailing; the largest debt liquidation in our history; and the beginning stages of a recession in the U.S. economy. Indebtedness is among the root causes of this train wreck, with the aggregate stock of U.S. debt rising from 163% of GDP in 1980 to nearly 350% of GDP in 2007. Only two economic sectors accounted for this massive increase in leverage: households and the financial sector, in which indebtedness jumped from just 21% of GDP in 1980 to 83% in 2000 and 116% in 2007. As a result, our financial system is now significantly undercapitalized in equity. One thoughtful commentator, Andy Xie, formerly of Morgan Stanley, estimates the real economy may need as much as the equivalent of 40% of current GDP in extra equity, or over $5 trillion, to bring the system back into balance. This is nearly one third of the present stock market’s total valuation. Whether this guess is correct or not, it provides the investor with some idea of the potential scale of the problem before us. Through the mechanism of global trade, and because of the financial links that now exist among world markets, no nation will be untouched by this period of contraction of both the credit system and the real economy. Recently, the magnitude of this contraction has been witnessed in the U.S. financial economy with the end of the investment banking business model. Going forward, the entire shadow banking system is likely to contract by a breathtaking degree. Hedge funds, another beneficiary of the shadow banking system, are on a similar downward spiral, generating returns that have failed to justify the one-sided fee structures commanded by the fund managers. With their investment toolkits depleted of leverage and many shorting instruments, hedge fund redemptions for the balance of the year will be in the hundreds of millions of dollars. A third consequence of the liquidation of the shadow banking system will be an unexpectedly large number of bankruptcies in the private equity world. Under the assumption that their long-term funding commitments allowed them to sidestep the problems of “borrowing short to lend long” or suddenly having to rollover funding needs, private equity firms went on a debt binge in the early part of the decade, which now looks very dangerous in retrospect. With deals once leveraged three or four to one in debt to equity, many private equity investments became leveraged 8 to 10 times equity in recent years. Many of these investments will go broke over the next several quarters. The contraction of credit will lead to contraction of consumption world wide. On a global scale, consumption is 60% of GDP; in the U.S., it is over 70%. With jobs shrinking, credit contracting, and home values still declining in the U.S., the outlook is very negative for consumer spending throughout the upcoming year and possibly longer. The gravity of the situation can be seen in the following housing statistics. There are roughly 50 million housing units in the U.S. and 20% have a loan to value ratio of 100% or more. Another 15% decline in house prices would double that number, dropping prices back down to the trend line values suggested in Figure 1 below. Meanwhile, unemployment will continue to rise as home values continue to decline. Private sector job losses have now continued for nine consecutive months. In the public sector, job losses reflect an eight-month decline. Over the next few months, the overall unemployment rate should rise to at least 8%, regardless of whatever government “bailout plan” is put into place. Despite its many detractors, the “bailout plan” must occur. If it does not, we may well have a global depression, not just a global recession. While government intervention will not cure anything in the short run, it will buy valuable time for a broader and more global solution to develop. Make no mistake about it: this is the gravest global financial crisis since the end of WWII. As such, our government’s participation is crucial. To allow partisan rancor and political pandering to stand in the way of immediate action is to turn a blind eye to the precedent-shattering realities of our current economic emergency. Congress may be clueless but they are not blameless. It is an emergency that no nation can avoid or ignore. Over the past 20 years, globalization has been a rising tide, lifting all boats and improving quality of life throughout the world. Today’s receding tide will have the inverse effect. More than one third of the world’s value of goods and services are traded; hence, we are all part of a greater whole in which a contraction of growth in any large trading partner will affect every other country. With such a game-changing scenario underway, how should the informed investor proceed? In the short run, avoid leverage at all costs, and beware of what deflation will mean for final demand and prices. Seek only those companies that have a clear, demonstrated and consistent history of generating annual free cash flow and that possess little or no debt. As my colleague David Pearl says, companies like this will never go broke. Balance sheets matter, and unleveraged ones matter most. Thrift will replace leverage. In the short run, it is all about deflation. In the long run, however, inflation will likely reassert itself. There will be a global battle between debtors and creditors. The debtors will desperately want inflation, whereas the creditors will want purchasing power protection for their debt holdings. This battle will not be insignificant and portends potential trouble for the dollar. On the currency front, the Federal Reserve can purchase the obligations issued by the Treasury to cover the losses in any bad debt disposals by printing money to pay for them. This would eventually lead to inflation. If creditors saw this strategy coming, they would dump their dollar assets and the dollar would crash, resulting in serious economic consequences. Therefore, a different and more global solution to this monetary chain-reaction must and will be found. And then there’s the issue of our national indebtedness. The U.S. is the largest debtor in the world but behaves like the largest creditor. We have a highly unrealistic view of ourselves, as illustrated in Fareed Zakaria’s book, The Post American World. Like it or not, we are returning to a multi-polar world and any solution will have to include the equivalent of a debt for equity swap from creditor to debtor. This will require the U.S. to become less xenophobic about investments from non-Western nations. Returning to the issue of currency, paper money as we know it will cease to function as a “store of value” but will continue to be a “medium of exchange.” Once the banking system is viewed to be secure, creditors will be under enormous pressure to invest their funds as values of debt paper are threatened by inflation which may well emerge as the big bugaboo. Cash-generating assets will be king and creditor countries will make massive investments in these instruments, many of which will be equities. At that point, the desire to own “real” goods may well resurface and commodities, particularly oil, will be back in favor. However, until then, look for commodity prices to sink as speculation vacates this sector and capital spending plans by commodity companies begin to slow. Overall, the massive deleveraging now underway will hurt profits regardless of what happens to profit margins and/or asset turnover metrics. Return on equity measures must fall simply because assets per dollar of equity will be declining for this reason, most analyst estimates for 2009 earnings are too high. I would expect further contraction of corporate earnings guidance for 2009. Needless to say, the prognosis for the stock market will be a poor one until these expectations are properly reflected in stock market levels. It is difficult, in times like these, to be unable to offer a guaranteed silver bullet that makes invested capital grow as market values plummet. So I will propose the next best thing: a time-tested investment strategy that, if executed thoughtfully and consistently, can provide balance in times of turmoil. At Epoch, our trademark focus on free cash flow and shareholder yield, as exemplified in our recent book of the same name, is the informed investor’s most reliable roadmap to capital preservation and, eventually, appreciation. To phrase it in the terms used earlier, the difference between our strategy and those that focus on near-term market fluctuations is the difference between a train and a runaway train: when the going is rough, both will feel it, but only one will be derailed by it.